With 325 social media accounts, 133 users, and more than 32,000 artists to promote, Live Nation Entertainment — the world’s largest producer of events — is an enterprise powerhouse. Live Nation’s marketing model is hub-and-spoke: the Live Nation central team creates content to support their local marketers across the United States. Until recently, however, those local marketers were publishing natively to each individual social network. This led to big gaps between the central and local marketers. 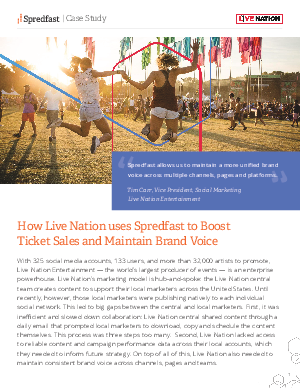 See how Live Nation used Spredfast to transform their social strategy.